Influenza, commonly known as “the flu,” is a highly contagious viral infection that attacks the respiratory system. Flu season typically runs from October to May of each year and peaks between December and February. When working in the long-term care industry, you must manage flu season very carefully, as individuals ages 65 and older are at a greater risk of serious complications from the flu compared to other age groups. The Centers for Disease Control and Prevention (CDC), suggests several measures – such as vaccination and infection control – to help prevent a flu outbreak. Flu vaccines are one of the most effective ways to prevent influenza and the associated symptoms. The CDC recommends that everyone six months of age and older receive annual vaccinations against influenza. Because long-term care communities are visited daily by healthcare workers, family members, friends, service providers and even new residents, influenza can be easily introduced into the environment. 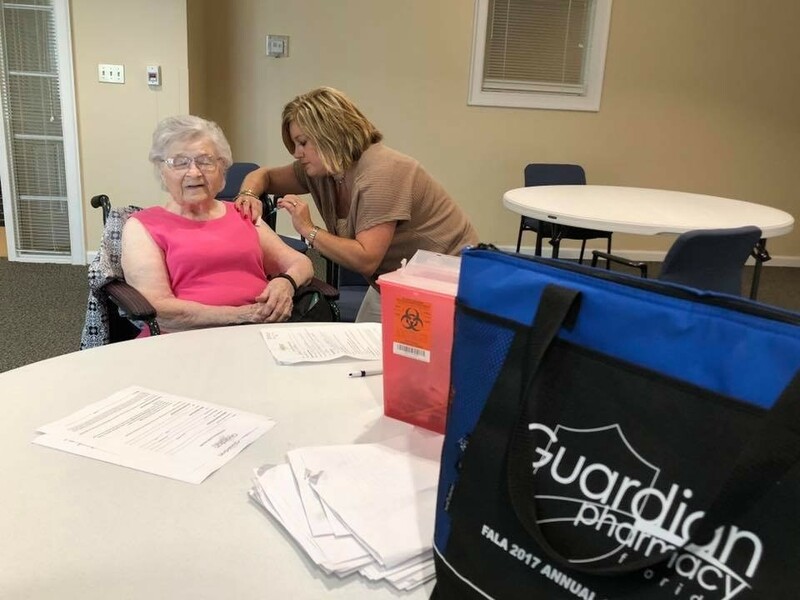 As the pharmacy provider to many long-term care communities throughout the Florida Panhandle and lower Alabama, Guardian Pharmacy of NWFL takes a proactive approach this time of year to keep the spread of this virus to a minimum. One of the ways we do this is by providing flu vaccinations to the residents and staff in our communities. Our clinical care specialist, Karey Lambert, RN, BSN and our nurse account manager, Stacy Quinnell, LPN have been quite busy administering flu shots to those that we service. Guardian Pharmacy of NWFL is happy to provide this service to residents in the communities we serve. If you are interested in learning more about this service, please contact the pharmacy at 850-306-3003.